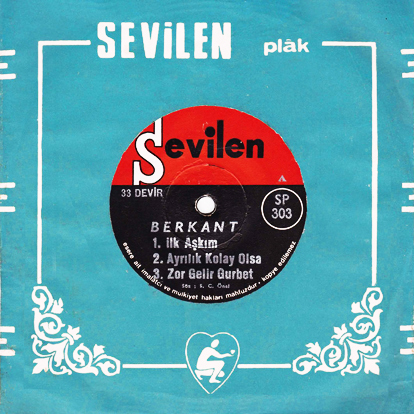 Berkant Akgürgen was born on New Years Eve 1938 in Ankara, Turkey. At the age of 19, he formed his first band Üstün Poyrazoğlu Orkestrası. Later that year, the band changed their name to Jüpiter Kenteti – or Jupiter Quintets. After a stint in the military, he formed Vasfi Uçaroğlu Orkestrası. Berkant recorded dozens of singles between 1966 and 1974, and many of the songs were collected on an album in 1974. In 1993, he attempted a comeback with an album called “Samanyolu ’93” – or “Milky Way ’93”. He died today – October 1st, 2012. This song, which translates as “First Love” was originally recorded by Ajda Pekkan. Catalog number SP 303 on Sevilen Plāk of Turkey, released 1972.